French Baroque specialist Edward Higginbottom writes eloquently about Charpentier’s neglect in the shadow of more favoured contemporaries, and it seems incredible to us nowadays that not one of the composer’s many sacred works was printed during his lifetime. The 1683 setting of De profundis clamavi (mourning the death of Louis XIV’s Queen Marie-Thérèse) features elegiac strings, sparing use of doleful recorders and refined choral singing; the New College musicians also give a mellifluous performance of the psalm Conserva me, Domine (1699). 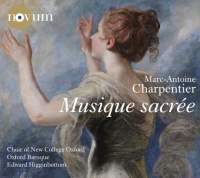 The second of Charpentier’s four Latin oratorios titled Caecilia virgo et martyr is a beguiling narrative steeped in the influence of his probable teacher Carissimi (it is different from the setting recorded by Christie – Harmonia Mundi, 5/80, 10/85). The small string ensemble of Oxford Baroque plays the Praeludium with a juxtaposition of sensuousness and decorum, and tasteful continuo subtly supports the solo singers’ moulding of a solemnly beautiful narrative of the virtuous St Cecilia’s martyrdom. The choir’s interjections are fantastically articulate – with gentle use of inégales, gorgeously shaped ornamental cadences and sincere delivery of the texts. The choral conclusion contrasts Christians grieving for Cecilia (‘Heu, nos dolentes!’) with consoling Angelic trebles encouraging them to rejoice; when the chorus proclaims its praise of God ‘in chordis et organo’, an organ is unleashed to splendid effect. Ensemble Correspondances give smallerscale performances of Charpentier’s six-part motets composed for his patron Mlle de Guise, using an intimate ensemble of single voices and single instruments per part (recorders often doubling violins) probably not too different from the domestic household of musicians at the Hôtel de Guise. 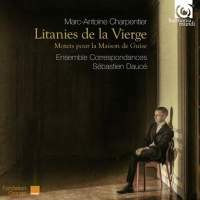 Sébastien Daucé directs a softly affecting performance of Charpentier’s most popular setting of Litanies de la Vierge (it has been recorded estimably by Niquet, Christie and Savall), and also a warmly honeyed Miserere probably composed for Holy Week 1685. On this evidence, Daucé has a tender affinity for Charpentier’s exquisitely crafted music.